As an international student from South Korea, I like to take this opportunity to introduce some South Korea’s controversial environmental issues. First thing comes to my mind is the Four Major Rivers Restoration Project. Simply put, the project proposed by the government is aiming at reviving four major rivers in South Korea. But, many citizens and environmental activists are very concerned about the project because they believe the project will cause negative impacts on several bird species and destroy the habitat. They also believe that estuaries will be impacted through increased rive pollution loads and an increase in shipping and infrastructure, rather than ecological restoration. 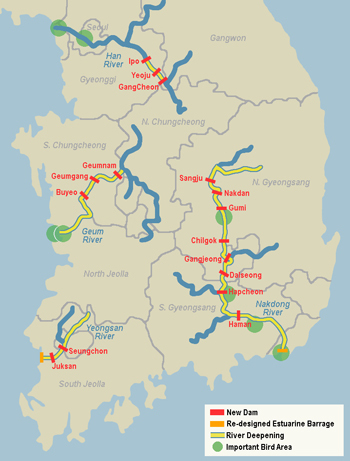 – November 2009: The project was formally launched – The project entails by 2012 the “restoration” or “refurbishment” of the nation’s four largest rivers: the Han, the Nakdong, the Geum and the Yeongsan. I still do not understand how the dams and bicycle roads will make the rivers alive with wildlife. Many people think that the project is for economy, not for environment, arguing government wanted to create more jobs and boost economy through the major constructions. I found that two Youtube clips are relevant. One is one of official campaign clips from the government and the other is a voice from environmental activists.